Immersive, spatial, three-dimensional, 360-degree, surround sound—call it what you will, all-encompassing audio is enjoying something of a resurgence thanks to the latest fast, powerful, and scalable digital audio technologies. Once upon a time, spatial audio could only be publicly experienced at cathedrals or concert halls, and in the modern era has largely been confined to cinemas and theatrical venues, but it is increasingly being adopted in a variety of corporate, retail, judicial, political, entertainment, and artistic applications. A highlight of the current Pink Floyd: Their Mortal Remains 50th-anniversary retrospective exhibition at London’s Victoria and Albert Museum is an immersive mix of a song from the iconic British rock band’s final live show in July 2005. With audio playback via Sennheiser’s AMBEO 3D technology, 18 Neumann KH 420 mid-field monitors, plus seven KH 870 subwoofers and wraparound video screens, “It’s like taking a shower in ‘Comfortably Numb,’” wrote a reviewer for U.K. music magazine NME. The end-user experience is one of four areas where Sennheiser is investigating and delivering immersive audio, Larcher reported. Supporting the rapidly growing fields of virtual, augmented, and mixed reality, for one, Sennheiser has introduced the AMBEO ambisonic microphone and the Venue Modeling VST plug-in. The company also sees a future for 3D music recording and streaming, including live content. A third avenue of exploration is live broadcast, she said, especially sports events, where the adoption of Dolby Atmos and MPEG-H in the global next-gen broadcast audio standards demands supporting technologies. Sennheiser’s AMBEO Smart Headset is a set of earphones with a built-in binaural microphone, enabling a user to record a binaural soundtrack to video on his or her phone via the Lightning connector. On the consumer audio front, Sennheiser has announced the AMBEO Smart Headset, a set of earphones with a built-in binaural microphone. Initially iOS compatible, it enables a user to record a binaural soundtrack to video on his or her phone via the Lightning connector, through Apogee converters, preamps, and SoftLimit technology. Another technology enabling spatial audio in a variety of venues is Meyer Sound’s MM-3XP balanced, DC-driven, self-powered miniature wide-range speaker, noted Steve Ellison, the company’s applications director, Digital Products. “For anyone doing a multichannel piece that is high-quality audio, distributed, and a fixed installation, it’s a nice way to go, regardless of what your front end is,” he said. One recent example is Nimbus, he said, a sculpture installation above an escalator at the Walt Disney Concert Hall in Los Angeles featuring music by Rand Steiger, who composed specifically for 32 discrete channels and loudspeakers. Meyer Sound has seen the most traction for spatial sound in the artistic world, applying technologies brought on board from the 2005 acquisition of LCS Audio to new DSP and control products. “It’s a way of adjusting room acoustics; we refer to it as active acoustics,” he said. A prime example, and a model for next-gen venues, is SoundBox, a rehearsal space for the San Francisco Opera, Symphony, and Ballet. Through Meyer Sound’s installation of its Constellation processing system with 28 microphones and 85 speakers, the acoustics of the space can be changed at the tap of an iPad button. The system’s brain, D-Mitri, picks up the ambiance via the mics, digitally processing the room acoustics to create an environment from dead to highly reverberant and immersive, or anywhere in between, to suit the performance or type of music. It’s easy to imagine that technology being used in corporate presentations. But visitors to Telstra Experience Centre in Sydney, Australia, don’t need to imagine. “It’s a corporate theater where they can do cinema surround; they had a concert in there streamed to the web; marketing presentations; and it’s used for speech intelligibility with settings to make it easier to do Q&A,” Ellison said. Ellison and Meyer Sound are excited by the potential for destination venues—music clubs, for instance—that offer live, interactive spatial audio presentations. “Think about interactivity in terms of acoustics: providing interactivity to the artist who can move or distribute sound in a way that is not a gimmick but something that you want to go and hear,” he said. Sennheiser’s Larcher also noted the integration of spatial audio technology in cyber justice or e-court applications. “Immersive audio can produce a natural soundfield and space where people are virtually together,” she said, in situations where the witness, jury, and accused are unable or unwilling to all be in the same room. Barco’s IOSONO CORE is installed at the heart of an immersive experience at the North Rhine-Westphalia state parliament’s visitor center in Düsseldorf, Germany. The real-time spatial AV experience is intended to encourage citizen engagement and education, and places visitors virtually on the chamber floor with their representatives. 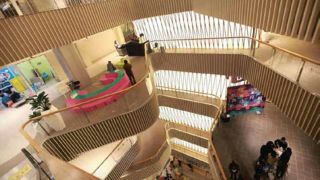 Barco’s distributor in China, Full Dimension, installed an IOSONO CORE processor driving more than 100 sE speakers on five floors at the Shanghai 189 Lane shopping mall. The system delivers contemporary and historical soundscapes of the city, as well as classical or electronic music. In late 2016, Barco announced that its IOSONO CORE object-based 3D sound processor had been installed at the heart of an immersive experience at the North Rhine-Westphalia state parliament’s visitor center in Düsseldorf, Germany. The real-time spatial AV experience is intended to encourage citizen engagement and education, and places visitors virtually on the chamber floor with their representatives. Barco has also seen worldwide uptake of IOSONO in retail and training applications. In early 2017, Barco’s distributor in China, Full Dimension, installed an IOSONO CORE processor driving more than 100 sE speakers on five floors at the Shanghai 189 Lane shopping mall. The system delivers contemporary and historical soundscapes of the city, as well as classical or electronic music. Anthony Mattana, founder of Hooke Audio, was used to storytelling through sound. But as a former Broadway theater sound designer, he was dissatisfied with the audio-for-video capabilities of the average smartphone. So Mattana developed Hooke Verse, a pair of Bluetooth headphones with integrated binaural microphones. “We made the world’s first lossless, high-quality, multi-channel Bluetooth recording codec. We’re able to stream 24-bit, 48K WAV files over Bluetooth,” he said. Because phones aren’t natively set up to receive—only transmit—audio over Bluetooth, a mobile app (free for iOS and Android) makes the process transparent to users. “It’s taken three years and a lot of money to figure it out,” said Mattana. An included custom cable allows the earphones to optionally connect to the analog inputs of any DSLR or GoPro camera. Upcoming features include a variety of sound filters and a forum for in-app content sharing.